The town of Benahavis is tucked a few kilometres inland between Estepona and San Pedro de Alcantara. This quaint and picturesque pueblo is considered the gastronomic capital of the Costa del Sol, home to some of the finest restaurants found anywhere in southern Spain. Los Arqueros Golf & Country Club is only a 5 minutes drive from San Pedro de Alcantara, just 8 minutes drive west from all the glitz and glamour of Marbella, Puerto Banus and yet just a few minutes drive away from the natural beauty of the Sierra de Ronda mountain range. 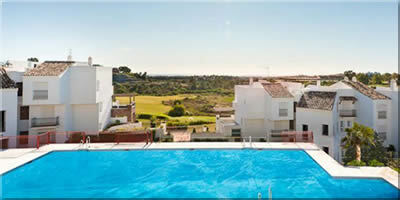 Ground Floor Apartment, Benahavis, Costa del Sol. 3 Bedrooms, 2 Bathrooms, Built 110 m2. Brand new townhouse in Urbanization Monte Biarritz. Penthouse, Benahavis, Costa del Sol. 3 Bedrooms, 2 Bathrooms, Built 150 m2, Terrace 150 m2. Middle Floor Apartment, Benahavis, Costa del Sol. 3 Bedrooms, 2 Bathrooms, Built 150 m2, Terrace 80 m2. 3 Bedrooms, 3 Bathrooms, Built 252 m2, Terrace 326 m2. We're in contact with 100's of agents on the coast and are regularly adding properties in Benahavis and Los Arqueros to our database. Please complete the form below if you would like to be informed of property in Benahavis and Los Arqueros as it becomes available.